In 2008 a small team joined together to take the magazine forward and keep Exmoor’s local publication local. We hope that you will pick up a copy from one of our many stockists or subscribe and, by enjoying an excellent read, help to support the magazine’s future! 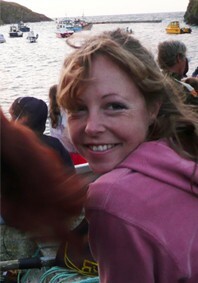 Writer, equine instructor in the UK and abroad, equine welfare adviser for Redwings Horse Sanctuary. Resident in Exmoor for over 20 years. Naomi has lived in and around Exmoor since 1979, grew up in Nettlecombe parish and attended Minehead Middle and the West Somerset before studying English at LMH, Oxford. She then worked in publishing for ten years before going to sea for a year as part of an ocean racing team and set up her own communications business in 2007. She took up the editor’s reins from Hilary in 2008 and bought Hoar Oak Publishing with friends in 2010. She lives in West Somerset with her partner Pete, the Editor’s dog, Hurley, and the very lazy ‘editor’s cat’, Turtle Puss, who makes occasional guest appearances on our Facebook page. Writer, interfaith minister, therapist and musician (formerly of Exmoor Border Morris Dancers for five years and now in French band and North Devon Folk Orchestra). Bryan moved to Exmoor from Hampshire in 1986, when his business there lost its marketplace. He bought a 9-bed hotel in Ilfracombe and ran specialised walking, cycling and motorbike holidays. This helped him get to know Exmoor really well. With this knowledge he started and ran the walking festival for 16 years. At the same time, he looked after the www.visit-exmoor.co.uk website for Exmoor Tourism. He was chairman of the South West Coast Path for 10 years from 2002 and heavily involved in the setting up of Tarka Country. Hilary sadly passed away in December 2014 and is hugely missed. She was longtime editor of the magazine and formerly Editor of the Exmoor Review, an education consultant, author, historian and lay reader. A resident of Exmoor for 45 years, Hilary was Naomi’s history teacher at Minehead Middle School and thus began an extremely long friendship. Grant has worked in advertising for nearly 30 years, including ten years with Devon County Council and has worked on tourism projects with Exmoor National Park Authority for the past 15 years. He has been married to Pam for 25 Years. They have three children. John lives in Dulverton. He has recently retired from Exmoor National Park Authority where he worked for 30 years in a variety of corporate roles. His interests include Exmoor (of course! ), cycling, walking and reading. Colin has over 15 years’ experience in design and photo manipulation. He loves nothing more than being on Exmoor of a weekend with his camera and dog Bella. With almost two decades of editorial experience, Katy worked over a number of years for an Exmoor-based publishing company, editing numerous local history books and gaining a broad knowledge and love of the area. After working for 8 years on Exmoor with the Active Exmoor project, Mike now manages a number of local websites part time whilst his day job keeps him busy as the Data & Business Analyst for holidaycottages.co.uk based in North Devon.